About two weeks ago, we made our first attempt at totschool. If you’re not familiar with the term, totschool is essentially a form of early homeschooling where you work on different skills with your toddler. The best way to sum up our week of totschool is to say that it was a learning experience – for my son and for me. You may be wondering why someone would want to start “school” with a toddler. For us, it was a bit of an experiment. The teacher in me was intrigued by the concept and wanted to try it out. We’ve been doing a variety of “learning” activities for quite some time and Baby Fox typically enjoys them. So, I thought more of these activities might be a hit. I approached totschool like I approached teaching in a classroom. I started by picking a theme and planning out activities for us to do. The list was detailed and I was excited to start a color week centered around Little Blue Truck, which is a favorite in our house. I was excited about the activities and ready to explore with my little learner. We started the week strong and he had a lot of fun playing and learning through the activities that I planned and set up. I loved watching him learn and play. It seemed like totschool was going to be a success until life happened. I can’t even tell you exactly what threw us off course. It may have been sickness or pregnancy woes or something else entirely. I can tell you that our summer (especially August) was filled with one twist and turn or another. We never quite fell into a routine, which made starting something like totschool a little difficult. 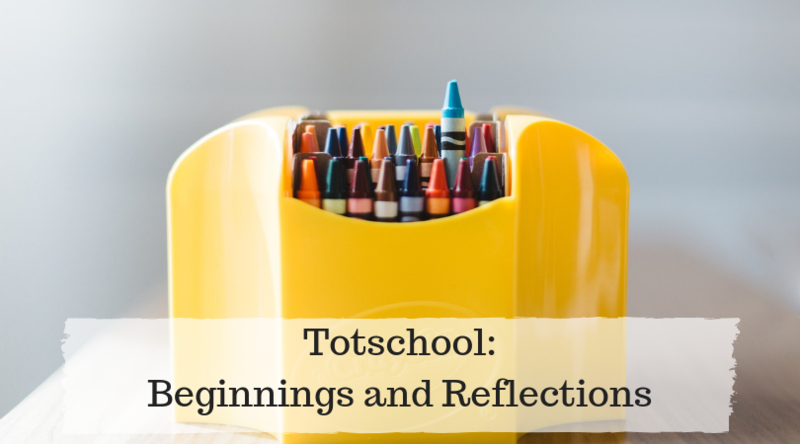 After our first week of “playing school,” I took some time to reflect on the experience and realized that totschool just wasn’t for us quite yet. 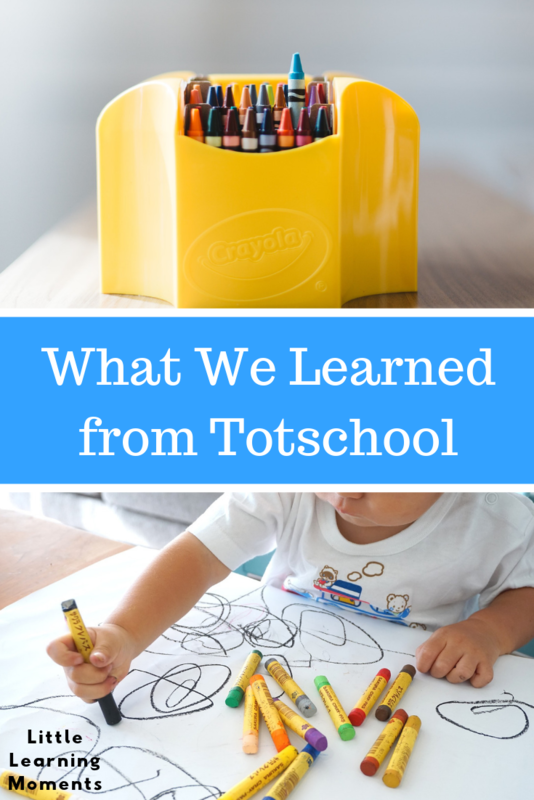 I still wanted activities and play-based learning experiences to be a part of our daily lives, but I didn’t quite think totschool was the way to go. So, I played around with things and did a little altering to come up with something that would allow for flexibility, play, and learning. For now, I’m calling our approach toddler invitations until I can figure out a better fit for it. I love planning open-ended play activities for Caleb. These are activities where I provide him with materials and let his imagination run wild. I might guide him towards a given outcome, but I always let him take his own path as well. It amazes me what he can come up with on his own sometimes. These are often referred to as invitations to play. During my week of reflecting, I realized that I wanted to include many opportunities for invitations to play (and learn) in our day to day lives. This is what I used as a basis for our approach. I’m still planning out activities in advance – I am a teacher and planner by nature after all. However, now, I’m allowing for more flexibility and realizing that we might not always get to the items on the plan. I plan two invitations and one activity for each day. Sometimes these are rotated through (and updated to meet our theme) and other times, they are completely new experiments. Since meals and naps are a mostly consistent thing in our schedule, I used them as a basis for my planning. I plan one invitation to play for morning and one for afternoon. I do not assign an exact time – instead, I let our moods and energy levels determine when I introduce these activities. Typically, I try to have one invitation set up for him to discover after breakfast and the other one I set up during his nap time. In addition to these invitations to play, which are very much child led play experiences, I also plan out a more parent directed activity for us to complete sometime during the day. Once again, I don’t schedule this activity. Instead, I let our day dictate whether or not it fits. Some days, I discover that an activity doesn’t fit and I reschedule it or scrap it all together. There’s no stress to get everything done and yet we’re still learning and having fun each and every day. I do hope to give totschool a try next year when my little learner is a bit older. It simply wasn’t a fit for our family right now and that’s okay. We can still play and learn everyday in a way that works for us. How do you encourage learning and play with your little ones? I’d love to hear about it in the comments below! If you’re interested in learning more about totschool, you can search my Pinterest board for inspiration and resources. You can also follow me @littlelearningmoments on Instagram to follow our play and learning adventure. I love this. We are doing “Tot School” but I too struggled with what was the best fit. Right now, I’ve decided that no true schedule is best. I’m using themes with a list of activities that we work through at our own pace. Right now it’s apples! I pick and choose how many things we do and when depending on our moods and the schedule of our day. It’s working for us so far! I love that! It’s very similar to what we’re doing. I love the flexibility mixed with the structure of having a few ideas thought out ahead of time. He loves most of the activities I pick, which helps as well. We’ve done a few apple things this week with our fall theme. Such a fun theme!